Is there any scent better in the world than coconut? If you disagree, I might just fight you. I LOVE all things coconut. So when I was coming up with my bath bomb recipe for this month, I knew I needed to make a coconut one. Not just coconut though… COCONUT CREAM! These coconut cream bath bombs is officially my new favorite bath bomb scent. Close runners up include the birthday cake bath bomb, raspberry pie bath bomb, and the allergy relief lavender lemon bath bombs. 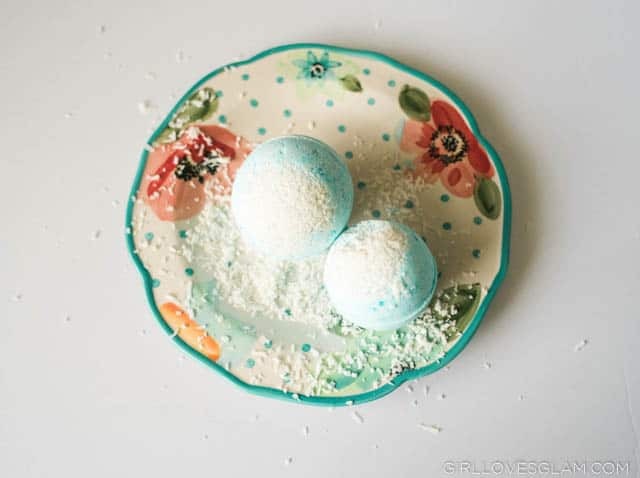 Bath bombs make perfect gifts for birthdays, holidays, graduation gifts, or even just gifts to yourself so you can relax! They are almost as fun to make as they are to use! Seeing the joy on someone’s face as they open a gift with bath bombs in it is a major bonus, too. 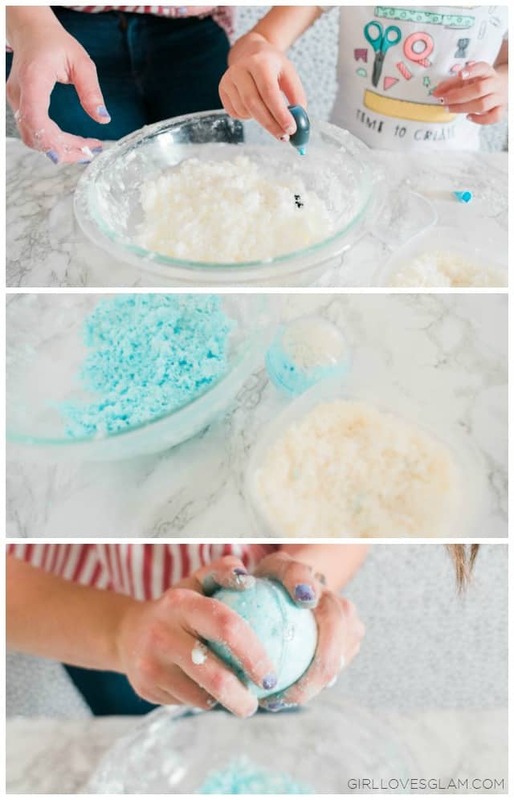 Making bath bombs is easy and fun! 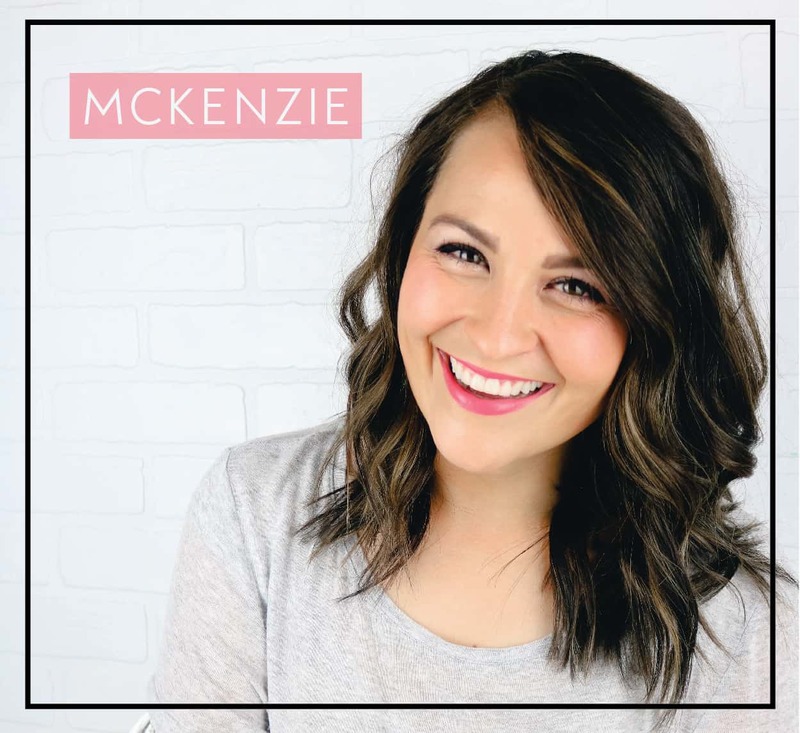 I love getting my kids involved because it is like a little science experiment that they can participate in and they get excited to take baths with their own creations! To get started, mix together the citric acid, baking soda, corn starch, and episom salt together. Add the coconut oil to your dry mixture. You can use solid or liquid coconut oil. I use whatever one I have on hand. 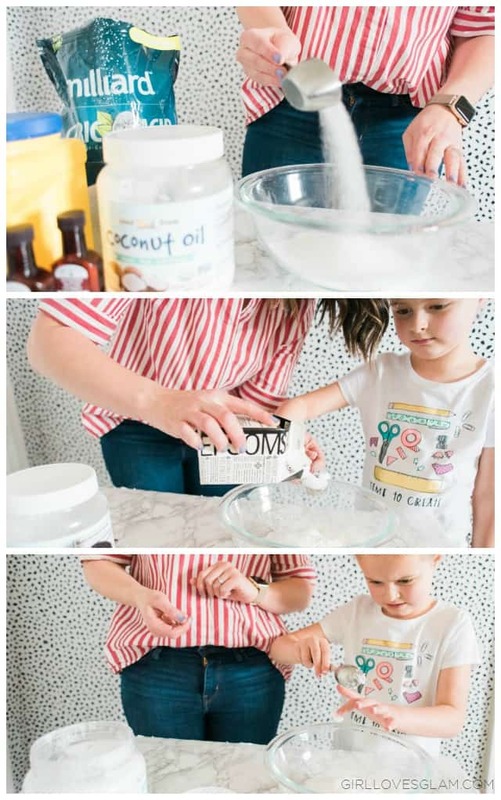 The main thing is just to be sure that you mix the coconut oil in well enough that it is evenly distributed throughout the mixture. I like to mix with my hands, rather than a spoon. Next, add your coconut and butter extract into the mixture. Make sure that you are mixing it as soon as you put the liquid in. The mixture will start to react to the liquid as soon as they touch. Spray the witch hazel into the mixture, 5 sprays at a time. Mix it all together and spray with 5 sprays of the witch hazel. Continue doing this until your mixture is wet enough to hold itself together when you smash it in your hand. You don’t want the mixture to be too wet, or it will continue to react and fizz away. 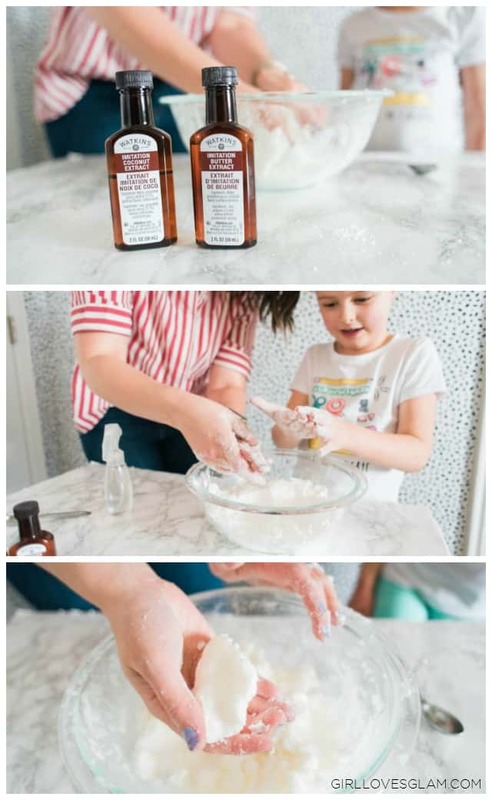 If you happen to add too much witch hazel, you can add more of the dry ingredients to save your mixture from being ruined. We love having fun colors in the tub, but adding food coloring is 100% optional! If you do choose to add food coloring, add a few drops of food coloring to your mixture and mix it well. 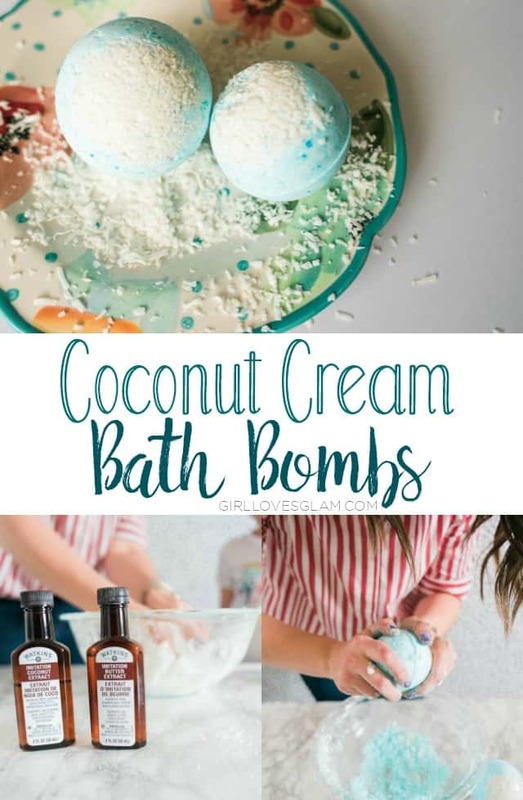 Take half of your bath bomb mold and sprinkle unsweetened coconut in the bottom of it. This is totally optional as well, but it definitely makes the bath bombs a lot prettier! Add the bath bomb mixture into the bath bomb mold and pack it down tightly. Add more of the mixture to the other half of the bath bomb mold and push them together. Hold them together with a rubberband. You can let your bath bomb sit and dry like this overnight, or you can also just put them in the freezer for at least 30 minutes. When you are taking the bath bombs out of the mild, be VERY careful. I usually twist the bath bomb mold really gently, until one side of it comes off and then carefully twist and tug on the other side until it comes off. Be SO careful when you are doing this part. Now I need to know… do you love coconut as much as I do?! 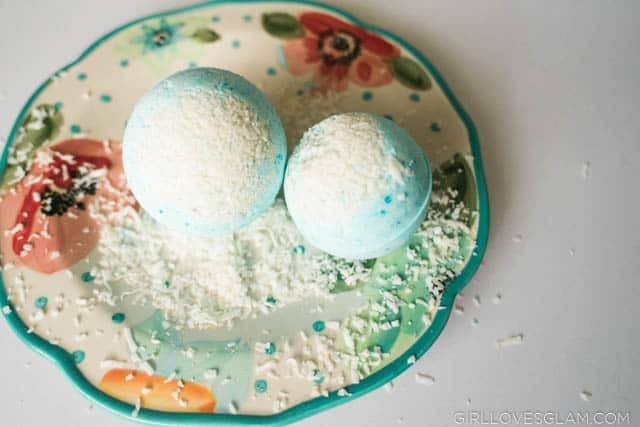 You need to tell me if you try these bath bombs (or any of my other bath bomb recipes).